Last year, Hitch and I decided to stay in the South King County area to spend Thanksgiving with friends and to see our families for one last time before our first real maiden voyage across the asphalt seas of America. Thanks to our generous friends, we are parked in their driveway … which by the way, is known as “moochdocking” by the RV community. We spent our first week learning the about the internal workings of our Airstream, but we mostly moved all our gear into the trailer and organized it just short of OCD levels. We made our first RV dump run with little trouble and decided to move the trailer to the other side of the driveway since it would be easier. Little did we know that we would be a Hotel California for yellow jackets the moment we unhitched and set up the stabilization jacks. I’d like to point out that adult yellow jackets mainly eat the rich sugars and carbohydrates found in fruits, flower nectar, and sap. The larvae feed on proteins derived from insects, meats, and fish, which are collected by the adults, who dutifully chew and pre-digest the food before feeding their larvae. Many of the insects collected by the adults are considered pest species, making the yellow jacket beneficial to agriculture. In the autumn, the adults are desperate for food to feed the next generation who will emerge next spring. Usually by the first freeze, adults that aren’t sheltered in a warm hive die. I did a bit of research, and also found that Mud Daubers or Mud Wasps can cause problems for the Airstream owner. When you find a mud dauber in your Airstream, its usually building a nest made of mud. Female mud wasps are the only ones who build these nests. Adults of both sexes frequently drink flower nectar, but they stock their nests with spiders, which serve as food for their offspring. We took a trip to Airstream Adventures Northwest, where a service adviser told us that wasps like yellow jackets are attracted to the smell of propane. 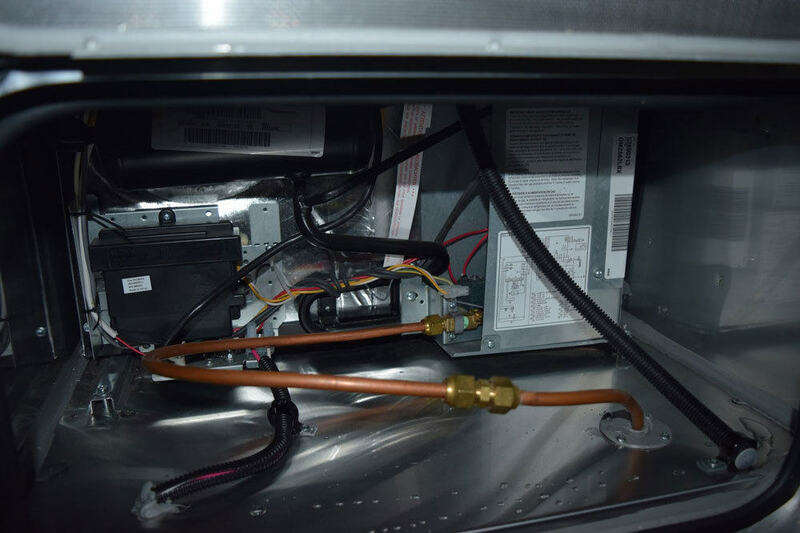 To them, propane smells sweet, and the exhaust from either the water heater, heating furnace and the refrigerator can attract them into the Airstream. We were advised to get additional “mud dauber screens” or insect screens for exhaust vents and “aluminum insect screening” which you can cut to shape, for access panels leading to the refrigerator ventilation and water heater. 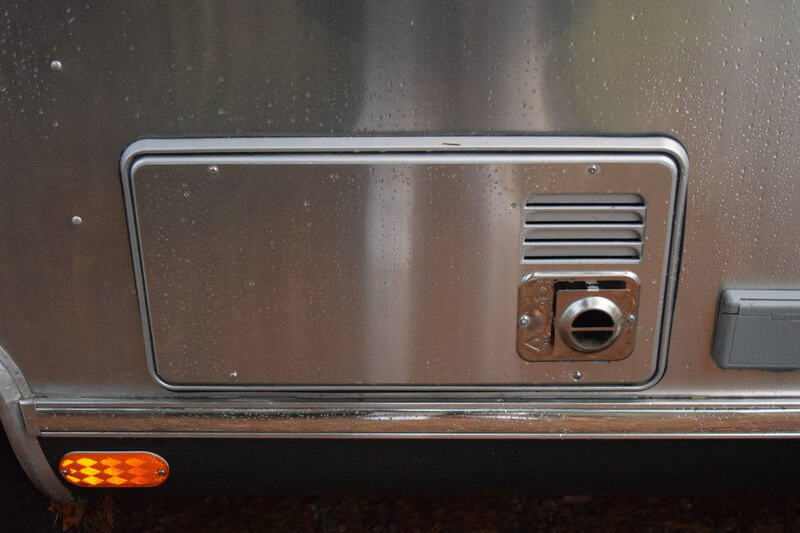 Our Airstream service adviser went on to say that if we were still finding wasps in our trailer, then we should clean out vents using an air compressor capable of 60 PSI. 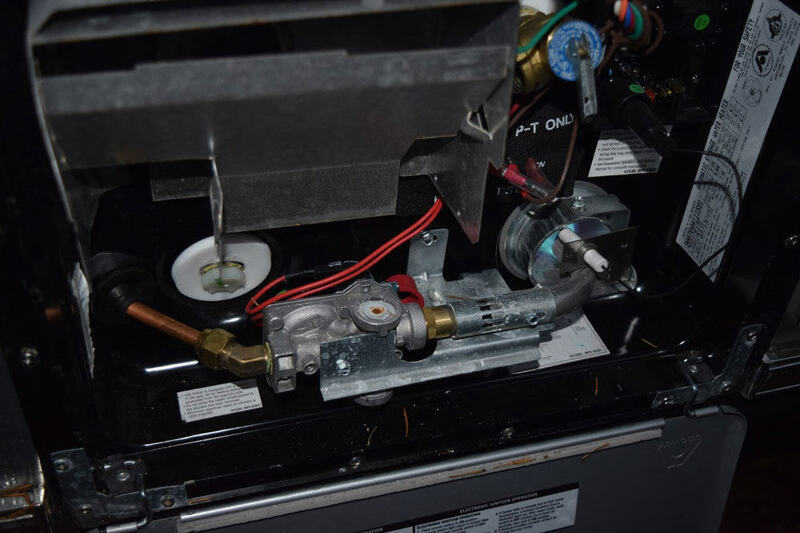 Vents to especially blow-out was the refrigerator exhaust pipe behind the burner jet or behind the power module and the water heater vent system just behind the spark probe. If you are an Airstream owner reading this, I suggest visiting your local dealership’s service center for a quick Q&A with a service adviser. The refrigerator also gives off propane exhaust. After a cursory search on the internet, I found that many RV and Airstream owners said that inserting or hanging a dog flea collar in these high wasp attraction areas would repel any wannabe insect homesteaders. Personally, I wouldn’t do this with the furnace exhaust, because that vent tends to run very hot when in use. We also had another working theory as to why the yellow jackets were interested in our home: the Airstream was warm and the insects were attracted by the heat. Regardless of the reason, the buggers found their way into the trailer. Unexpectedly and oddly, they’d come flying out of the skylight fixture in a dazed and loopy fashion, drunkenly flying and then ram themselves into unconsciousness against a window or wall. They hardly made a threat in that state. I almost pitied them, as swept them out the door. We also bought yellow jacket traps and set them outside of the trailer, but only caught three wasps in total. By the third day, no more yellow jackets showed up. Either because the weather got too cold for them to fly around or we exhausted the colony’s numbers. Hitch noticed through the skylight frame a number of shadowy insect bodies lay dead or dormant. After taking our Airstream in for service, the technicians discovered that there wasn’t any sealant around the rim of our skylight. They fixed the error, and even double checked the second skylight, and then made sure that any other openings where insects could get in were also sealed. Author’s Note: The orginal date of this post was in November 2015. I decided to update this post from last year, and include new information we’ve learned along the way.